At first glance, the drone might look a lot like the older models, but that’s only on the exterior. The Syma X5HC-1 has been upgraded with some significant new features. It now flies a lot smoother than the older models, the blades are mounted differently (the newer ones have quick disconnect), the motor is a bit more efficient and quiet, and most importantly – the drone now has altitude hold, or what Syma calls “hover mode”. 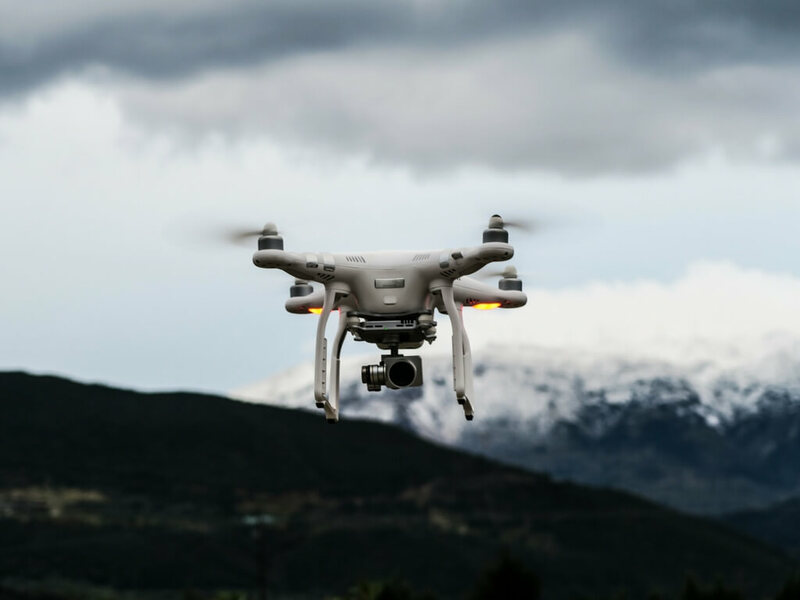 Hover mode basically allows you to not manipulate the throttle stick to keep the drone at a certain altitude – you can let go off the remote controller and the aircraft will remain at that altitude by itself, making it easier and more enjoyable to fly. Another thing you’ll find in this drone are the removable prop-guards and the same 2MP detachable camera from the previous Syma X5 models. Of course, you also get the green&orange LED lights on the bottom of the drone so you can easily identify the drone’s direction (orange is the front, green is the back). 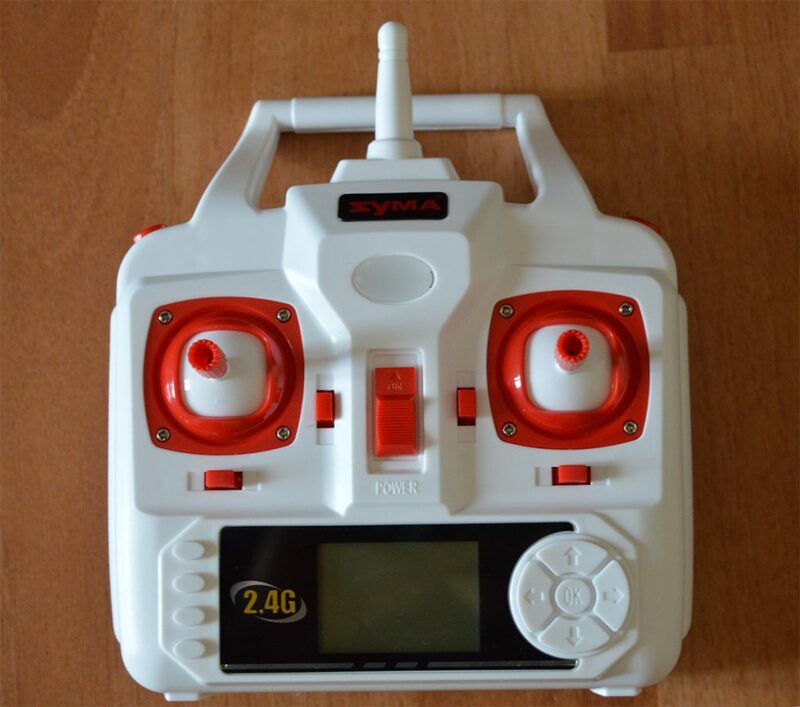 The drone’s remote controller is the well-known Syma remote. Its controlling distance is around 30-50 meters, but during my tests I was able to easily fly it for around 80-100 meters (without the camera attached and no prop-guards). So I’d say it really depends on the current weight of the aircraft, but the wind can also contribute to better or worse range. The remote control itself takes 4 AA batteries which are not included in the package. You’ve also got your fine-tuning trim buttons around the sticks – they serve in cases when the aircraft is hovering in the air, and it automatically starts flying forward/backward/left/right. You can press the corresponding trim button to rectify its direction. The button on the upper left corner of the controller switches between High and Low Speed, as well as toggling Headless Mode on/off. The button on the upper right corner is the “flip” button: you press it, you will then hear a beep, then you select a direction in which you want the aircraft to flip and it automatically flips. Lastly, the buttons around the LCD display on the bottom of the controller are dummy buttons with no real use. 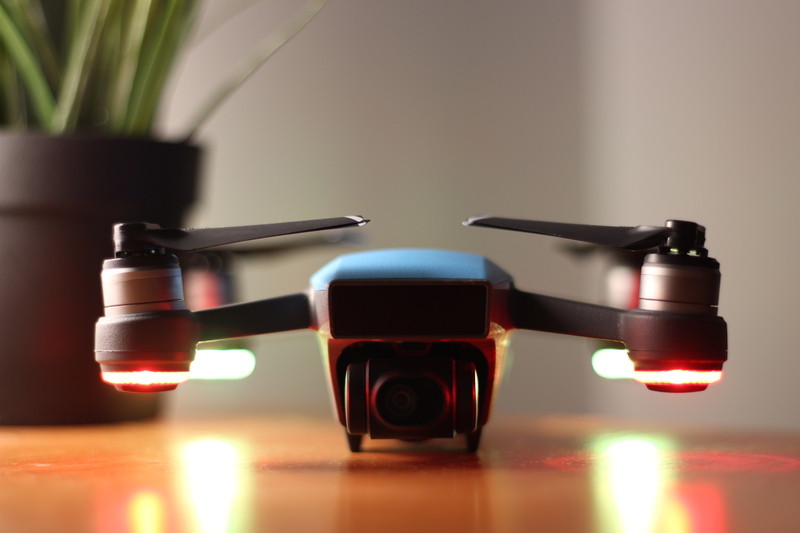 Headless mode – As we all know, every drone has a front side and a back side. When you and your drone are facing the same direction, pressing the left directional stick of your remote controller should fly your drone to the left. But when your drone turns around and its front is facing you, the controller and your drone front are in the opposite direction. Meaning pressing left will actually send the drone to your right, and vice versa. This could be very confusing, especially for the non-experienced flyers. I think it’s safe to say every drone flyer has experienced an unwanted change of direction (or crashes) because of this. But when Headless mode is activated, this problem is easily solved – as long as you turn on the mode when the remote and the front of the drone face the same direction, it will always go to the left when you press left and it will always go to the right when you press the right stick. This is great when you just want to have fun and don’t want to constantly observe the direction the drone is facing. My recommendation is to try to get used to piloting a drone without Headless mode, as this will help you in the future if you want to pilot bigger and better drones. However, taking the drone for a quick and fun flight in the park without thinking too much is a great option, which is definitely nice to have. High hold mode – This mode uses the Syma X5HC-1’s built-in barometric sensor. It allows you to go up in altitude and let go of the throttle stick and the quad will hover in that altitude using the barometric sensor. As a mode that relies heavily on the barometric sensor instead of GPS/satellites, this feature works really great. During my tests I found out that you can easily fly the drone with one hand, as you don’t have to constantly manipulate the throttle stick to keep the aircraft in one area. While I was flying the drone it felt really nice and smooth, definitely much better than some of its similar-priced competitors. A very important fact about this aircraft is that is’s so lightweight that it could easily be blown out by a strong gust of wind and be sent into a tree/wall. So my advice is to try flying inside first (in a large enough area), so you can get used to the controls first and then only fly the X5HC-1 outside in calm weather when there’s no wind. When you do fly it in calm weather though, this thing is extremely fun! 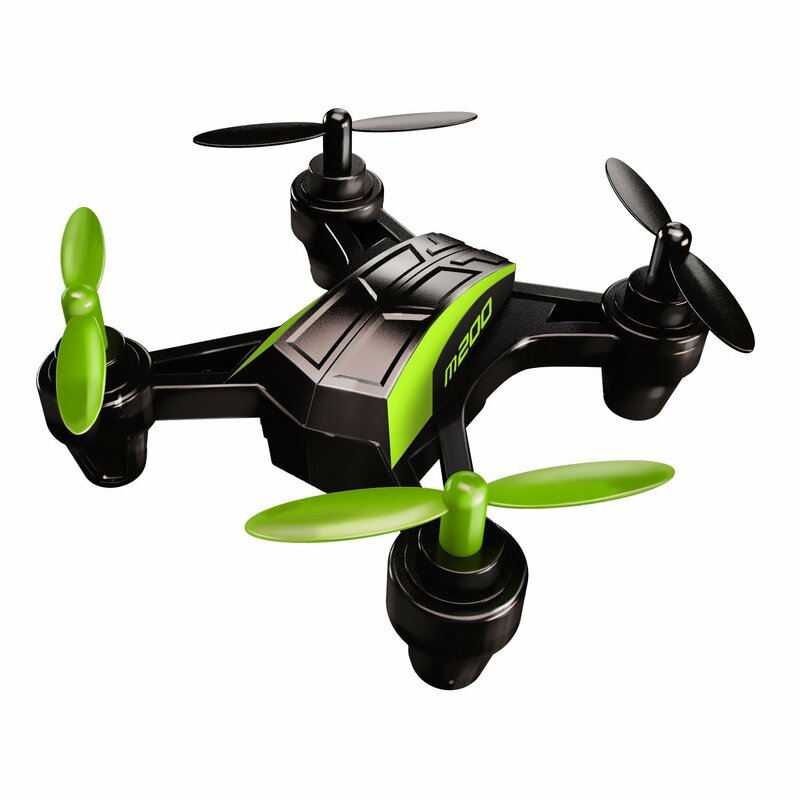 You can easily fly this drone in the park, maybe even around some obstacles (only if you know what you’re doing! ) and do some flips with it (there’s a special “flip” button on the remote controller). Another nice feature is when you’re doing flips, the drone compensates after a flip and goes back to the same altitude it was when you initiated the flip – this basically allows you to just hold the controller with one hand and have tons of fun flying around. You should keep in mind that the altitude hold mode cannot be switched off and that makes the landing a bit tricky – the drone descends slower than usual and you should be careful not to keep the throttle down too much, because this will stop the propellers instantly and if the drone is still high in the air it will just freefall from there. There’s definitely a learning curve, but if you are careful you’ll get used to landing in no time. As far as the camera, the quality is suprisingly good for a drone priced under $100. 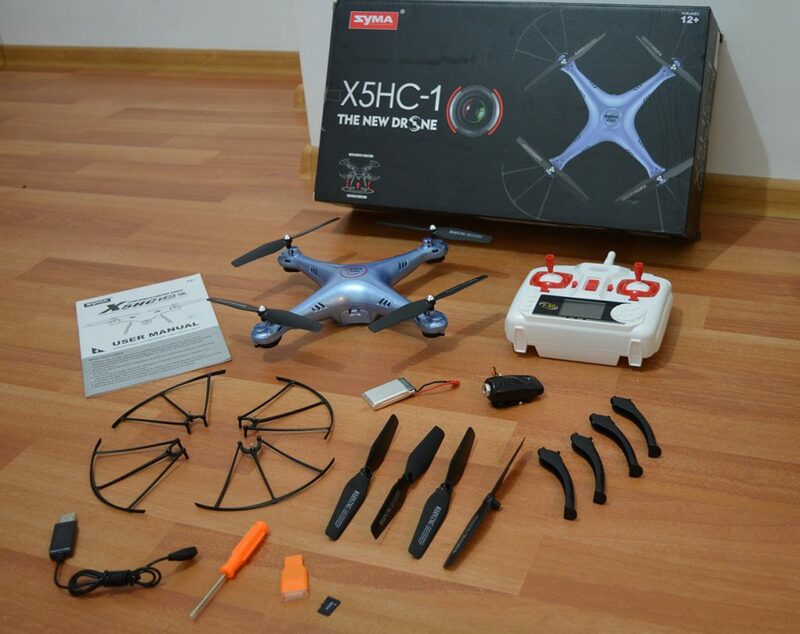 It has definitely improved over the older X5 models, and it seems Syma has managed to greatly reduce or almost completely remove the “jello effect”, which is so popular among the cheaper quadcopters these days. 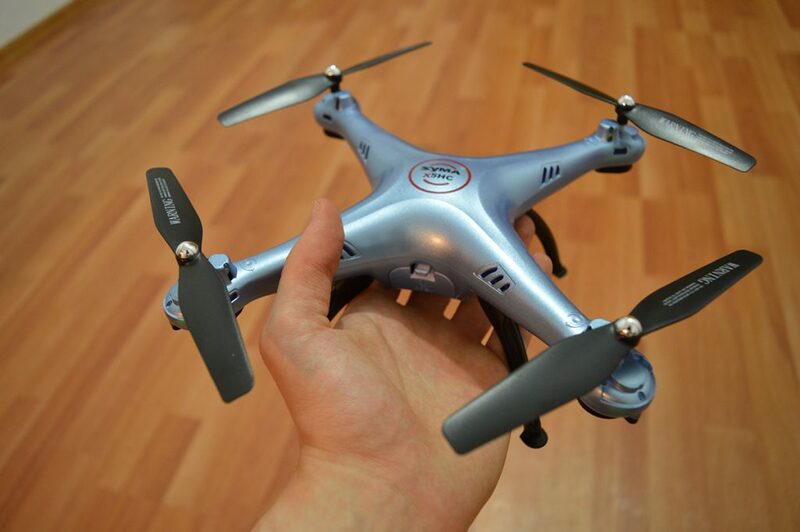 As any other small drone, you should not expect an amazingly-long flying time. 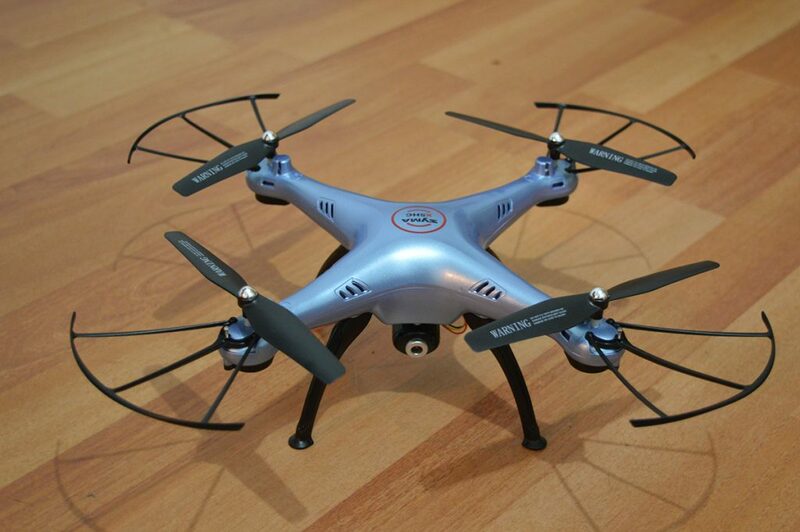 These drones have small batteries, and usually last between 5 and 10 minutes in the air. The X5HC-1 is no exception. It flies between 7 and 9 minutes, but that also depends on the flying conditions and if you’re filming/taking photos, if you have prop guards on/off or the landing gear is installed. Basically anything you remove from to the drone will squeeze a couple more seconds/minutes of flying, so have this in mind. I usually fly without the camera and with no prop guards installed. That way the drone lasts around 9 minutes in the air. 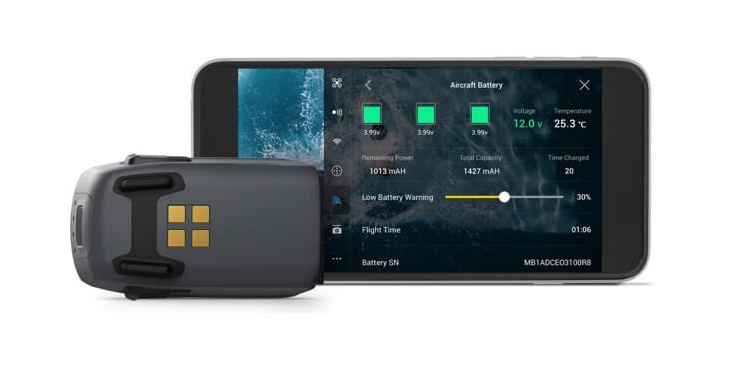 As the charging-time for the drone’s battery is between 90 and 130minutes, I consider buying additional batteries an absolute must. You have plenty of space in the battery tray so you can even fit a bigger battery and enjoy some longer flights. Please be aware that the X5HC-1 uses a new type of connector, so if you own a couple of regular batteries for older Syma drones they will not work with this one. Here’s what you can expect upon opening the Syma X5HC-1 box. You can purchase the Syma X5HC-1 from Amazon through this link. To finish off this Syma X5HC-1 review, I’d say this quadcopter was a ton of fun to play with and I’d definitely recommend it to anyone who’s looking for a cheap, reliable drone to start with. 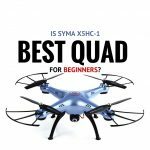 While it may not be the absolute best aircraft for a beginner due to some of its shortcomings, the Syma X5HC-1 is definitely up there in the top3 cheap beginner drones. 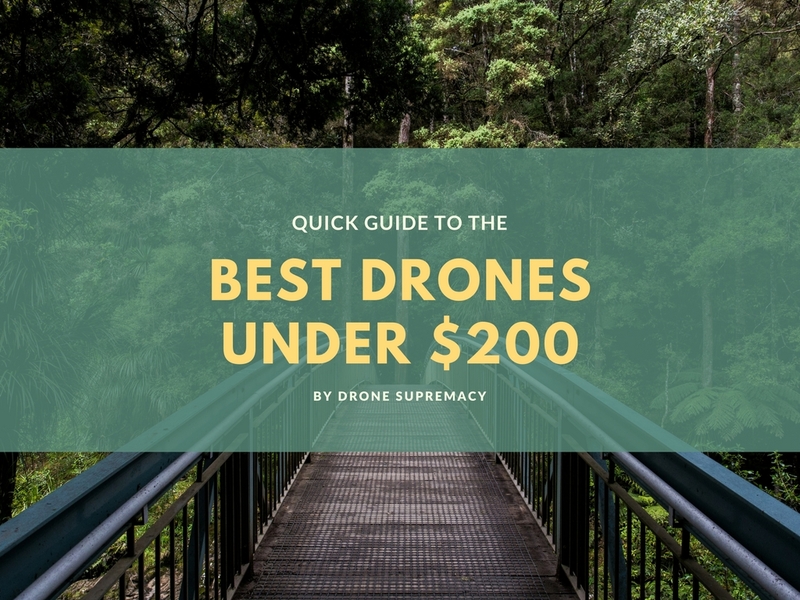 Those are 2019’s best quadcopters priced under $100. Inside you’ll find the best beginner drones to help you start your drone journey today. 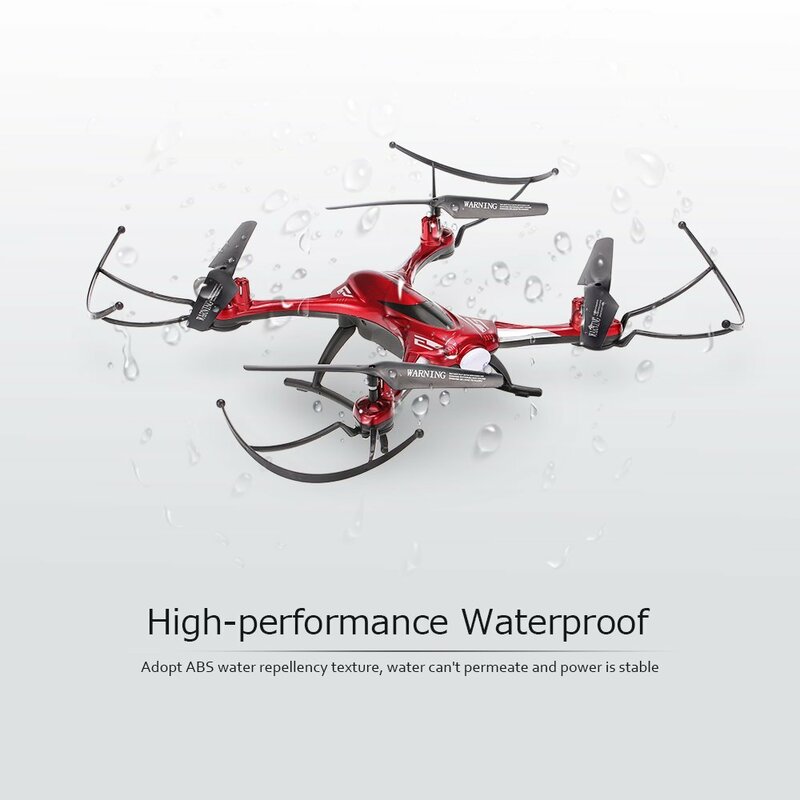 MJX Bugs 6 Review – Cheap Racing Quadcopter! 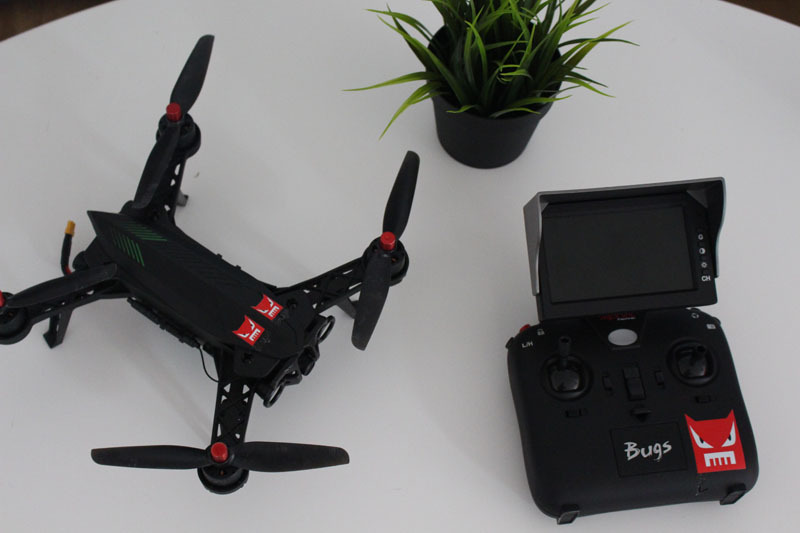 The MJX Bugs 6 is a cheap racing quadcopter that will give you good taste of what flying a fast drone feels like. 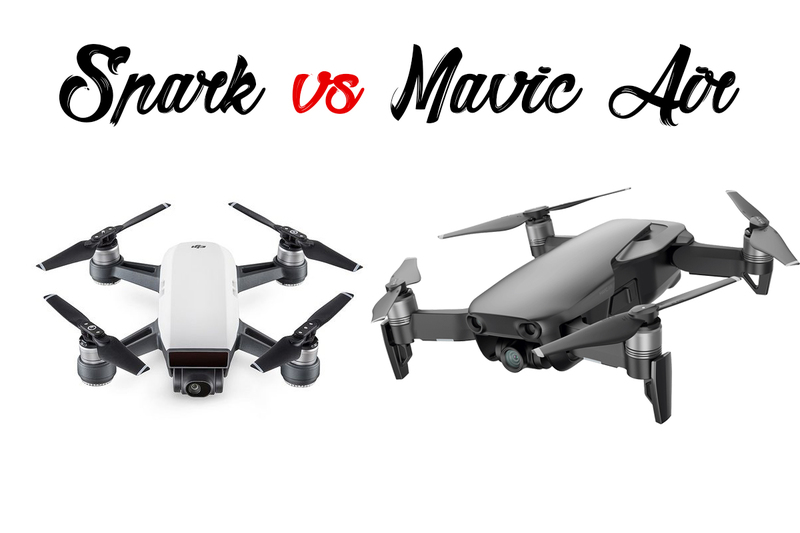 DJI Spark vs. DJI Mavic Air – Which One To Buy? The ultimate comparison between the DJI Spark and the newly released DJI Mavic Air. 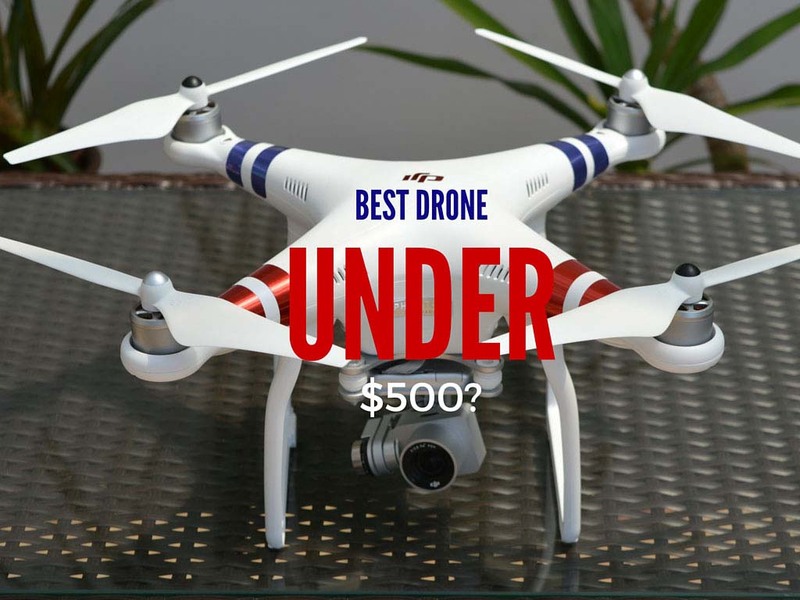 Find out which drone fits best for your needs! The DJI Spark is the cheapest and smallest quadcopter ever made by DJI, but how does it perform after 6 months of heavy usage? Naturally, since the Spark is an affordable quadcopter, people are asking tons of questions about it. 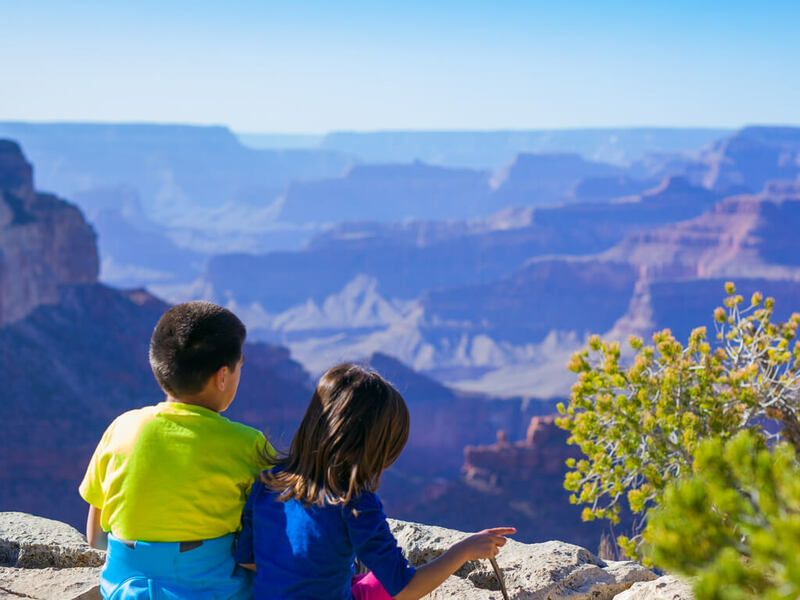 In this article, I’ll try to cover as many as possible so you get answers to any of the questions you might have. 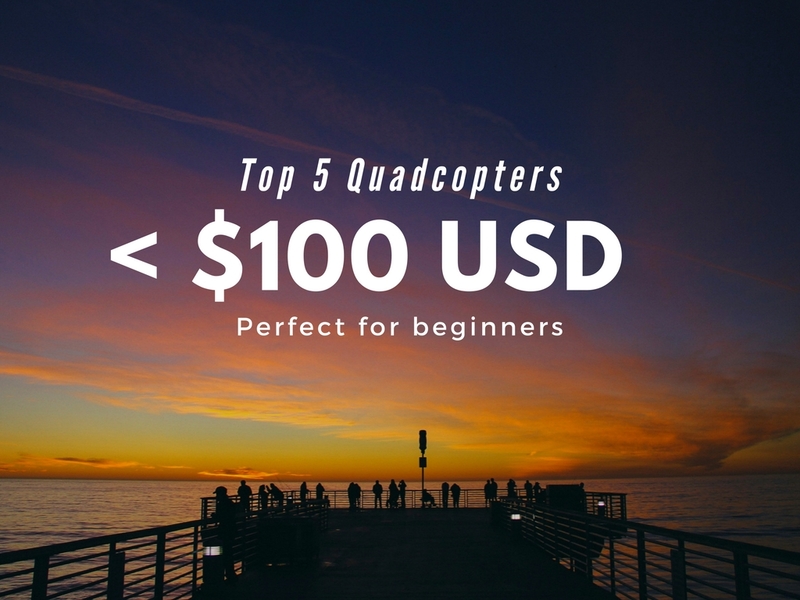 There is a huge variety of quadcopters under 200 and it’s difficult to choose just one. 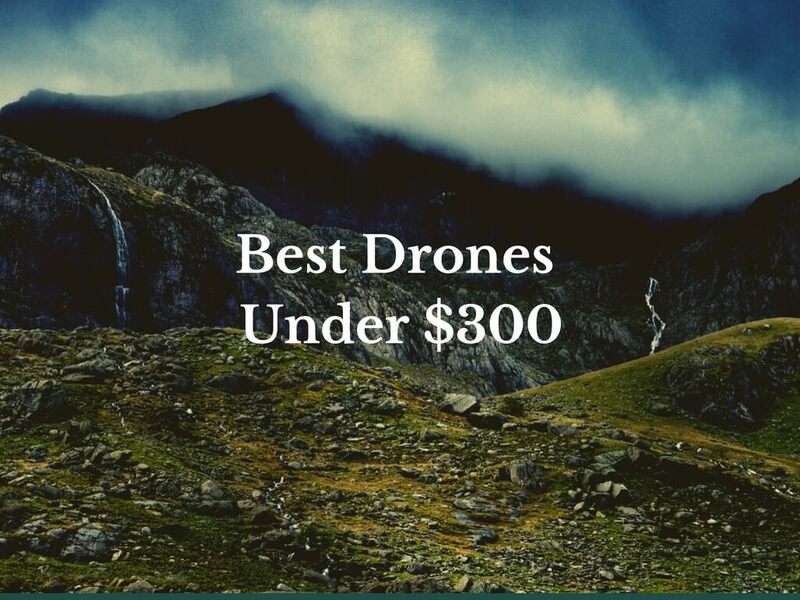 Luckily, I’ll list the best drones under 200 bucks to help you out. 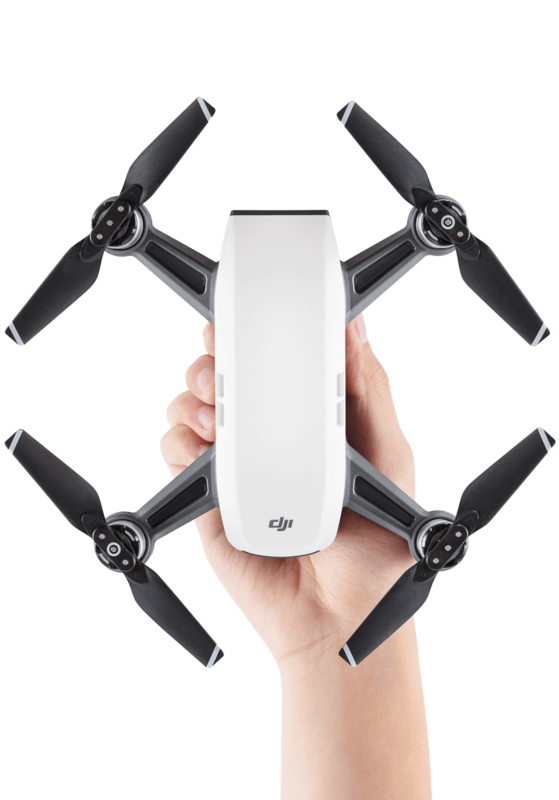 DJI Spark – Announced! First look, Specs & Release Date! All about the upcoming selfie drone from DJI – the Spark. The Sky Viper M200 Nano Drone comes at a very reasonable price, charges very quickly and is really easy to just pick up and play. Have been seeing them listed as both X5HC and X5HC-1. What is the difference? As far as I know (not 100% on this one! ), the X5HC-1 stands for first iteration of the model. Overtime they produce small fixes & improvements, and this allows people to distinguish the newer models from the older. I bought this drone, and initially loved it. Flew it for a week with no crashes, then all of a sudden, there was no altitude control. It would zoom up or descend to bounce off the ground. Unflyable. So I contacted the company and they sent me another one, but it did the same thing. I’m wondering if this is a problem with all of Syma’s products, or just this model. I did get a refund, good company. I have 2 syma X5HC&X5HW they fly great .You need to calibrate these drones after a hard landing or a crash.Both sticks down and right corner the both stick down and to left corner, Read your manual .Before every take off I do a calibration,and have good flights after that is done. The package box size for cheaper shipping.The 1 come in a smaller box then the X5HC is a larger box for retail store display.